It was a delirious thought, a delicious idea, an idea none of us could have refused if we had wanted to – one project, one story, five perfumers and six writers, all of them and all of it wrapped up in a city whose very name echoed its own kind of silken promise – Venezia. 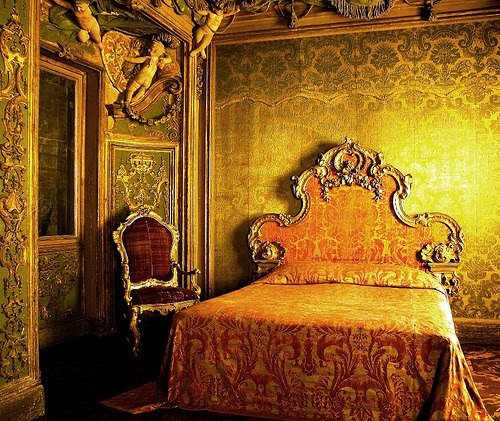 Venice, where Romuald had lived out – or dreamed – his decadent self, all those sensual pleasures he had never known until Clarimonde. We were all of us assembled in our rented palazzo in the Cannareggio, there to create another kind of magic and breathe our mutual inspirations into other stories we would tell in essences and absolutes, in words, songs and poetry, in utterly magnificent meals and laughter both sumptuous and intoxicating. But all was not well on the Fondamenta della Misericordia in the Cannareggio…Two ferocious guard dogs – the hounds of Hecate? – guarded us from unwanted visitors, and one morning, we woke to the horror of finding one of them mysteriously dead, apparently eaten by the other, and just as eerily as they came, they vanished. Until the token blonde – that would be me – was stalked by an apparition of my own, yet this ghost was no vampire, and I knew him very well. He would always come when I least expected it, always when I happened to be alone, lurking behind a column on the Piazza San Marco, reaching out to grab me from a murky alleyway in the Giudecca, startling me on the darkened stairwell of the palazzo at 2 AM as I went to fetch my notebook and write by the fire, distracting me as he only knew with all he had. I’ve never slept with a dream pillow before, and once again, I’m presented with perfume in a novel form to experience in a novel way. 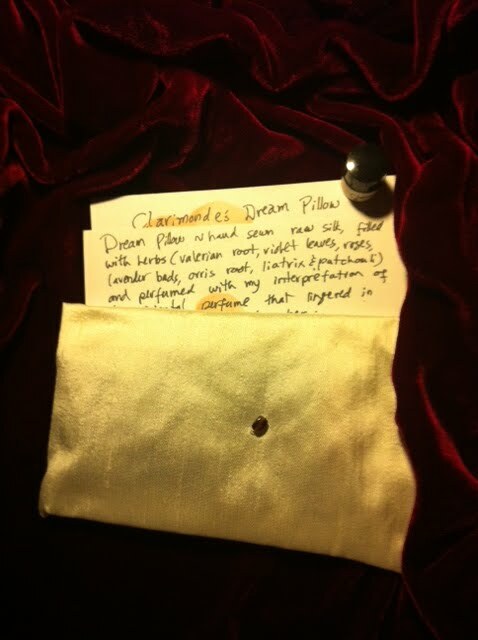 The dream pillow – about the size of a folded handkerchief – is placed in the pillowcase above the pillow, and as you move and stir in your sleep, its odor is released as the herbs and leaves are warmed by your head. I had my slight hesitations about the valerian – it may indeed promote a restful night, but it also has a unique, unmistakable and not entirely pleasant scent. I had nothing to fear as it happened – only that my cats, attracted by the valerian, both insisted on pillow space as well, which they did. Yet that pillow gave me such dreams…dreams interlaced with the story of Clarimonde, half-awake musings perfumed with the herbs and the evocative perfume that scented them, musings lost to pages in my journal as I fell back asleep and dreamed other, equally haunting stories, ghosts and places. I wrapped it in tissue paper and put it away last night. Having either the flu or a bad throat cold, a fever and sleeping with a dream pillow turned my dreams into startling Technicolor phantasmagorias bound like a ghostly ribbon with the perfume Ayala also calls ‘Clarimonde’. Each of the perfumes created for the Clarimonde Project have focused on different moments of the story as they inspired the perfumers and as we writers in our turn were inspired by those perfumes…Monica Miller’s ‘Sangre’, the perfume of an entire love from epiphany to heartbreak, Maria McElroy and Alexis Karl’s totality of desire, ‘Immortal Mine’, Mandy Aftel’s solid of sacred solace ‘Oud Luban’, and now, with Ayala’s ‘Clarimonde’, that moment in her bedchamber when the last rose petal drops in the flickering candlelight as his beloved breathes her last. She is gone, eternity is lost, and only this opulent, even decadent creation to remember her by…the cold, earthy-green wintry breath of violet and ionone (a natural violet isolate), the plush, pulsing, burning heart of saffron and rose and carnation, and the long, lingering drydown of antique patchouli, sandalwood, dragon’s blood and costus, echoing Romuald’s lifelong regret. In its depth and the breathtakingly rich patchouli drydown, held aloft by its piquant, intoxicating pillars of costus and sandalwood and dragon’s blood, like the token drop she takes from Romuald every night, like the pomegranate seed of garnet on the dream pillow – or Persephone’s pomegranate seed in reverse – is all of one hapless priest’s eternal regret, and all that he has lost, and all he yet had in those vertiginous, unforgettable moments he dared to truly live – and dream – Venetian. ‘Clarimonde’ perfume: Antique patchouli, sandalwood, costus, saffron, roses, carnation, violet and ionone (natural isolate), cassie and dragon’s blood. Photo of Ayala’s ‘Clarimonde’ presentation: my iPhone. Disclosure: The sample was sent to me for review as part of my participation in the Clarimonde Project.